The National Museum of Bargello in Florence displays the most important collection in the world of Renaissance Tuscan Sculpture, with masterpieces by Donatello, Della Robbia, Verrocchio, Michelangelo, Benvenuto Cellini, Jacopo Sansovino, Giambologna, Lorenzo Ghiberti and Filippo Brunelleschi, along with a significant group of medieval French ivories, Italian majolicas and arms. 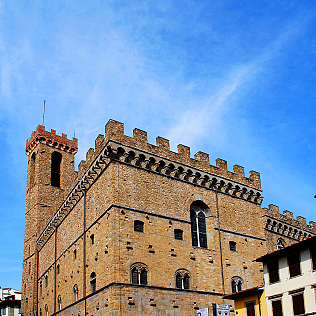 The ancient medieval palace, that houses today the Museum, was born as the residence of the Captain of the People, then of the Podestà of Florence and at last of the Captain of Justice (called indeed \"Bargello\"). Lately in the 14th century it was transformed in a prison and, afterwards a complete restoration, in 1865 it was opened as Bargello Museum. At the beginning it was dedicated to Medieval applied arts, then in 1887-1888, in occasion of the Donatello\'s Year, the Hall of Renaissance Sculpture was opened and the collection was further enlarged between the late 19th century and the early 20th century thanks to private donations and legacies too. Several masterpieces are collected in the various museum halls, such as Tondo Pitti by Michelangelo, his Brutus and his Bacchus; the David by Donatello; the bronze reliefs cast by Ghiberti and Brunelleschi in competition for the second door of the Florentine Baptistery.